Wondering what we are doing with Sunday nights at the restauarnt. Well, here you go. Vino + Vinyl is moving to Thursady nights. We already do $1.00 corkage fee on Thursday nights, so we are going to break out the turntable and spin some records as well. Sadly, we are going to close on Sunday nights. We thank all those that walked in fromt he neighborhood, and spent Sunday nights with us. We are going to have some new and exciting things happening at Corner Table. I just wanted to take a moment this morning to thank everyone who grew, cooked, decorated, served, ate, drank and in any other way were involved in the wonderful evening we had last night. 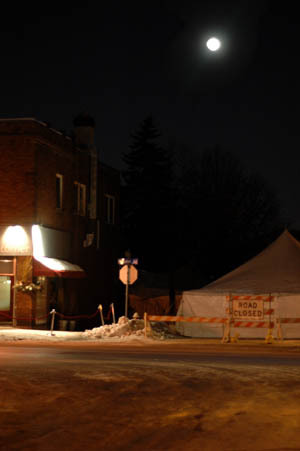 It truly does take a leap of faith to come out on one of the coldest nights of the year to a tent set up in the middle of a Minneapolis street, and that’s just what you did. You’re amazing. Thank you all.